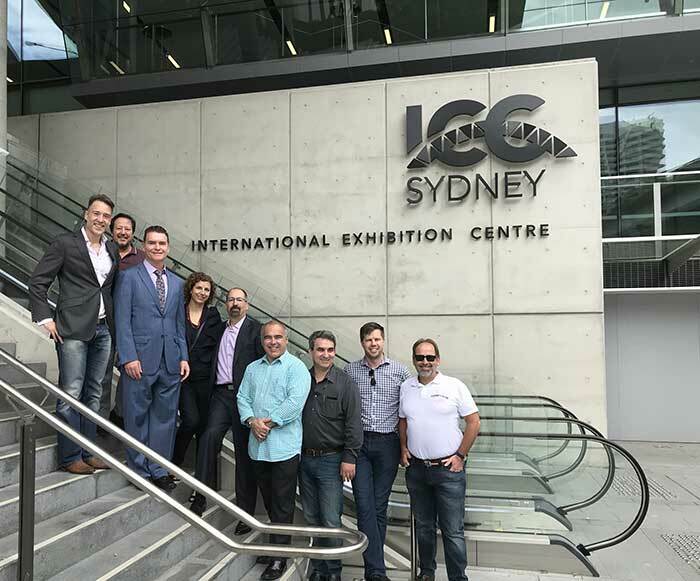 I am delighted to report that the Executive Officers’ trip to Sydney, Australia exceeded our expectations as we previewed the site of the INS 13th World Congress, which takes place May 25 – 30, 2019. The venue, the International Conference Centre Sydney, is an expansive, light-filled facility overlooking the Darling Harbour. This facility opened one year ago. It is a state-of-the-art building with fantastic meeting rooms and space that lends itself well to networking. There are many excellent hotels within a short walking distance to the congress venue and local attractions. The area includes many excellent restaurants. During our site tour in December, the INS Executive Officers -- President-Elect and Editor-in-Chief, Robert M. Levy, MD, PhD; Congress Chair and Director-at-Large Marc Russo, MD; Secretary Konstantin Slavin, MD; and Treasurer Fabián César Piedimonte, MD, PhD; and I – were accompanied by Executive Director Tia Sofatzis and Ira Hajdamacha of Kenes Group (the new congress organizer). We were joined by the very enthusiastic and dynamic local organizing committee: Richard Sullivan, MD, president of the Neuromodulation Society of Australia and New Zealand; Nick Christelis, MD, the local organizing committee chair; and Paul Verrills, MD, the local organizing committee co-chair. I want to thank the local organizing committee members for their energy and efforts that contribute so much to the excitement and anticipation surrounding the 2019 congress. The local organizing committee will help engage local talent for the scientific program, and organize the cadaver workshop. Its members will also assist with promotion and social media. I invite all of you to also serve as ambassadors of the meeting, to spread word of this exciting venue and program through word of mouth. Caption: From left to right, visiting the site of the INS 2019 World Congress are Local Organizing Chair Dr. Nick Christelis; INS Treasurer Dr. Fabián César Piedimonte; INS President Dr. Timothy Deer; INS Executive Director Tia Sofatzis; INS President-Elect and Editor-in-Chief Dr. Robert Levy; INS Congress Chair and Director-at-Large Dr. Marc Russo; INS Secretary Dr. Konstantin Slavin; Neuromodulation Society of Australia and New Zealand President Dr. Richard Sullivan; and Local Organizing Committee Co-Chair Dr. Paul Verrills. As we await this major global congress, two large regional meetings are in the offing for 2018 that involve a number of our chapters. First, the second INS Interim Meeting will be held Aug. 8 – 11, 2018, in Rio de Janeiro, Brazil, in collaboration with the Brazilian Neuromodulation Society, Sociedade Brasileira Neuromodulação. Second, the 1st Joint Congress of the INS European Chapters will be hosted by the Benelux Neuromodulation Society from Sept. 20 to Sept. 22, 2018 in Nijmegen, the Netherlands. The organizers anticipate at least 400 delegates will attend this event. Meanwhile, the 21st Annual Meeting of the North American Neuromodulation Society, NANS, takes place Jan. 11 – 14, 2018, in Las Vegas, Nevada, USA. 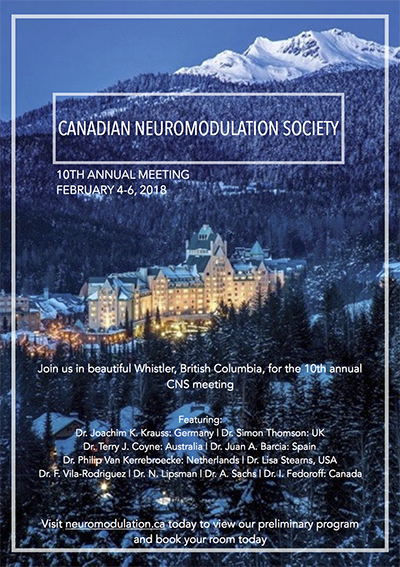 The following month, from Feb. 4 – 6, 2018, the Canadian Neuromodulation Society holds its 10th annual meeting in Whistler, British Columbia, Canada. We wish both chapters well with those upcoming annual meetings! Finally, we are looking ahead with great excitement to the imminent release of a new mobile application to facilitate access to recommendations of the Polyanalgesic Consensus Conference. The app will be free to download, and offer CME credit to use. It will have an indexed list of recommendations that can be viewed on an Android or iOS device. Please stay tuned about that development and other plans to be announced for the year ahead. Meanwhile, I wish you all the very best in 2018. The International Neuromodulation Society Board of Directors has elected Prof. Jan Vesper, MD, PhD, as the incoming INS treasurer. His three-year term will start in September 2018, during the Joint Congress of the INS European Chapters in Nijmegen, The Netherlands. Prof. Vesper was previously elected to a four-year term in 2014 as president of the German Chapter of the INS. We thank Fabián César Piedimonte, MD, PhD, who served ably as treasurer during the course of two terms, beginning in 2012. Facial pain, a multi-faceted problem that has several potential neuromodulation therapeutic interventions, will be the next topic for an INS Expert Panel. The panel, for members only, takes place in the INS Global Discussion Forum on the INS website (logon required). Discussion will be moderated for two weeks, from Feb. 20 through March 6, 2018, by three esteemed neurosurgical specialist members of INS who have diverse clinical experience in the treatment of facial pain. Stana Bojanic, BSc MB BS FRCS (SN) - Dr. Bojanic has been a consultant in Oxford since 2004, and is an honorary senior clinical lecturer at Oxford University. Her specialist interests include neuromodulation, spinal surgery and the management of facial pain. She serves as part of a multidisciplinary treatment team in instances of facial trauma, and is part of the neuromodulation team using peripheral nerve stimulation for neuropathic face pain and intractable trigeminal neuralgia. In addition to being president of the Neuromodulation Society of United Kingdom and Ireland, she is a member of the Society of British Neurological Surgeons, and a College Assessor for the Royal College of Surgeons of England. Christopher Honey, MD, DPhil, FRCSC - Dr. Honey, president of the Canadian Neuromodulation Society, completed a doctoral degree in neurophysiology at Oxford University and began practicing neurosurgery at the University of British Columbia 1996. He has a large practice in the neurosurgical management of facial pain and is recognized for his experience with motor cortex stimulation for facial pain. Andre Machado, MD, PhD - Dr. Machado is chairman of Cleveland Clinic's Neurological Institute. His primary research interest has been on studying the targeting of the affective sphere of pain as a means of improving outcomes and quality of life. He recently authored the first-ever randomized controlled trial of deep brain stimulation for pain in the Annals of Neurology. The 10th Annual Scientific Meeting of the Canadian Neuromodulation Society takes place Feb. 4 - 6, 2018 in Whistler, B.C., site of the 2012 Winter Olympics, at the Hotel Fairmont Château Whistler. Please visit the CNS website (www.neuromodulation.ca) for information or to register. The program of presentations, posters, and invited lectures by world experts will cover a wide range of topics concerning neuromodulation therapies and emerging treatments. The purpose of SANE is to publish about the regional work on Clinical Neuromodulation and Interventionist Neuromodulation both in pediatric, young and adult patients and in small and large animals. We are currently working on a project to improve the doctor-patient relationship through academic and educational activity of SANE during the coming year. During the year, (starting at the NANS meeting in January, 2017) there have been many teleconferences and meetings, mainly with regard to the organization of the 1st joint congress of the INS European Chapters, hosted by the BNS. After many discussions, the local committee has chosen to organize the congress at a specific venue in Nijmegen, September 20 - 22, with a preconference on the 19th (cadaver workshop and a specific training for nurses). The main reasons for this initiative are that the European chapters, given the rather small number of members, are confronted with organizational, financial and logistic difficulties to organize their own chapter meetings, biannually. Furthermore, as a consequence of new European laws, the industries are not allowed to sponsor individual physicians anymore. So, chapter budgets are becoming even more restricted. 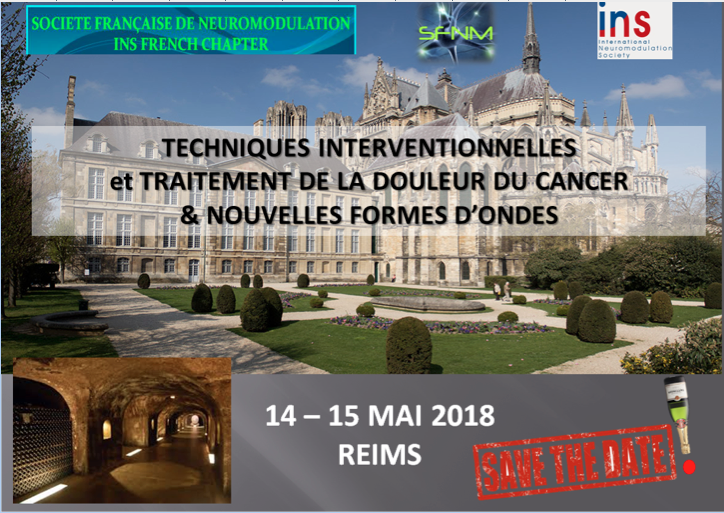 So, the aim is to have a congress with at least 400 participants at a very fair fee, with a focus on both innovative new science regarding neuromodulation, and also with an attractive social program to emphasize the instigation and exchange of neuromodulation initiatives within a framework of European collaborative actions. In 2017 Mike DeJongste will resign from his position as president of the BNS. Monique Steegers has accepted to be the president elect. Maarten Moens will prolong his position as secretary and Harold Nijhuis as treasurer. All minutes of the BNS meetings are available for the INS. Please contact the secretary Prof Dr Maarten Moens for further information. The Canadian Neuromodulation Society elected a new Board at the 2016 AGM and Professor Christopher Honey will preside as President for the next 3 years. Currently, we have about 50 members in the organization. Our Mission Statement has been revised, and is as follows: To promote education and access to neuromodulation therapies across Canada. Education includes professional development and encouragement of best clinical practices, as well as supporting patient, family and community awareness. Promoting access to care includes government advocacy and leadership in healthcare policy concerning neuromodulation. In keeping with our mission statement, we are currently collecting data to determine access to neuromodulation throughout Canada, and this data will also be a focus of our upcoming meeting. We are planning to host our next annual meeting in Whistler, British Columbia (site of the 2012 Winter Olympics) from February 4th - 6th, 2018. Topics covered at this meeting will include: Deep Brain Stimulation, r-TMS, intrathecal therapies, and Spinal Cord Stimulation. Presentations will be made by an array of prominent international and national experts. We expect about 150 healthcare providers to be in attendance for this meeting. • The China Chapter of the INS was established in 2009, and the current number of faculties of China Chapter has been increased to 24. • Chinese Neuromodulation Society (CNMS) which was founded in 2010 by Professor Guoming Luan who chaired the China Chapter at the same time, has already become one of most influential medical society in China. The Standing Committee included 1 president (Dr.Guoming Luan), 6 vice presidents, 33 board members. Also 114 faculties who come from 121 hospitals covering 29 provinces have joined CNMS. • The number of registered members of CNMS has been increased to 473 persons from 280 persons. • Several branches have been established in CNMS, including the Young Committee, Electrical Stimulation Group, Pain Group, and the Chongqing Committee of CNMS. • The 2017 annual meeting of CNMS and the China Chapter was successfully held in Jinan, China, with almost 600 attendees from neurosurgery, neurology, urology and neuro-engineering. • Under the leadership of Dr. Guoming Luan, a China team that consisted of 14 experts joined the annual meeting of the INS in Edinburgh, UK. • In order to expand influence, the China Chapter of INS created a new journal named the “Chinese Neuromodulation Newsletter” which is published irregularly. Venue: Sanbo Brain Hospital Capital Medical University, China. Venue: Shenyang, Liaoning Province, China. Venue: Mianyang, Sichuan Province, China. Venue: Xiamen, Fujian Province, China. Participation: ACIAN, and coordinated by Dr. María Fernanda Rojas. Objective: To socialize the use of ultrasound in the interventionism field, generating a safe and comfortable alternative to specialists and their patients. Date: May 11th - 12th - 13th, Bogotá. Objective: To socialize the scopes of this medical specialty that is strengthened every day and to launch the INS Colombian Regional Chapter. ACIAN responsibilities: Coordination and Organization. Participation: President ACIAN, Dr. Omar Gomezese, Dr. Franz Colimon, Dr. Mauricio Orozco. Date: May 27th - June 1st, 2017. Objective: Strengthen the Colombian INS chapter. ACIAN responsibilities: Conference participation: The Experience in the management of ischemic pain and heart failure with SCS. Impact in quality of life and exercise. PARTICIPATION IN THE ANNUAL CONSTITUTIVE MEETING OF THE SPAIN INS CHAPTER. Date: October 21st and 22nd, 2017. Objective: Promotion of the association. speakers for future events in Colombia. Speakers: Lumbar management, palliative intervention and the state of neuromodulation in Colombia. Objective: To socialize the objectives of the association in order to consolidate the specialty and welcome new members, knowledge of the INS Colombian Regional Chapter in Bogota. Our association works with great commitment and sense of belonging in order to consolidate this specialty more and more every day. We develop academic spaces where the guild facilitates academic progress in order to optimally develop pain management practices. ACIAN, a non-profit organization, is dedicated to promote high quality practices of the specialty in Colombia, to promote the legislation of the exercise of the specialty, to lead and organize meetings of specialists in order to foster science and knowledge exchange and to promote the best practices for the wellness of humanity; ACIAN works in conjunction with the INS in order to generate scientific development of Neuromodulation. Take a moment to visit our website www.acian.org and feel free to contact us at 317-3821078 or email [email protected] or [email protected] We will be available to attend any questions and concerns. We invite you to be part of our team of specialists in the country. - Neuromodulation Basic Course for implanters: How to start? As a scientific activity, the Italian Chapter held its first cadaver course on March 31, 2017, in Arezzo, Italy. In October at Como we held the National Congress of the Italian Chapter of the INS with the introduction, for the first time in Italy, of a session on vagal nerve stimulation and a session on external transcranial stimulation with direct current. About 80 external participants and members attended this congress. Moreover, in the first part of the year we patronized two local congresses on vagal nerve stimulation for epilepsy and on HF SCS. Also there was a partnership with the National Congress of the Italian Society of Neurosurgery in June. For the last month of this year we concluded the Italian survey on burstDR SCS, and are continuing to collect data on the Italian experience of PNS. We published on the Chapter website in the Italian language, as required by national law, conclusions on the appropriate use of neurostimulation of the spinal cord and peripheral nervous system by the Neuromodulation Appropriateness Consensus Committee. As required by the Ministry of Public Health, we provided the Chapter's data for accreditation in order to be the scientific Society of reference for neuromodulation in Italy. The NNS concluded our 4th annual meeting in late October, and we would like to thank our speakers, industry sponsors, and participants for making this yet another very successful meeting. The meeting attracted 96 registered participants who chose to come to Oslo to learn, to debate, and to exchange knowledge about neuromodulation treatments. The very diverse program featured talks on rTMS, ITDD, SNS/SNM, MCS, and the LION procedure aimed at restoring motor function, as well as expert insight in neuropathic pain, neurophysiology in pain diagnosis, mechanism of action and clinical effect of the various new SCS stim paradigms, and on the cognitive function in pain patients. The meeting also saw the realization of two NNS initiatives we have been looking forward to launch for a long time. The NNS has now formally started our Nordic Neuromodulation Nurse Network, and Eva Leljevahl (Uppsala, SE) and Anne Lene Høst Knudsen (Aarhus, DK) have kindly agreed to lead the efforts. The network will be centered around the Facebook group Nordic Neuromodulation Nurses (https://www.facebook.com/groups/127984534589361/) and – for discussions that are not suitable for social media, like specific case discussions – the NNS Nurse Forum (http://nordicneuro.org/forum/viewforum.php?f=3). We hope the members will back up the initiative! The other initiative was the formal appointment of an NNS Science Coordinator who will take the lead in coordinating the research that goes on in our region. A better collaboration on the scientific area is one of our society’s raisons d’être, and we are very happy that Kliment Gatzinsky (Göteborg, SE) agreed to take the position. Kliment will work together with the board to unify the research initiatives in the Nordic. We also used the meeting to announce next year’s INS European Joint Chapter Meeting, taking place Sept. 20–22 2018 in Nijmegen, the Netherlands. The next independent Nordic meeting will be in 2019; the host city will be decided at next year’s General Assembly in the Netherlands. - That we will make an effort at reviving the Ask Your Peers initiative. The project has stranded due to lack of attention, so from now on it will run for a week 4 times per year with prior announcement. - That we encourage the members to use the NNS web page, http://nordicneuro.org. It has a document section, (http://nordicneuro.org/resources/documents.html), where we host documents related to our field, and a picture section (http://pictures.nordicneuro.org/) where we can store relevant pictures. There is already a full photo documentation of an SCS procedure there but more pictures are needed. We look forward to a most interesting year 2018. The following is a brief synopsis of NANS accomplishments through December 2017. At the start of the year, the January 2017 Annual Meeting was not only the 20th NANS Annual Meeting in our history; it was also the biggest neuromodulation meeting we have held to date, with over 2,600 total attendees. Just under 2,000 of this total were medical, allied health, and scientists/researchers. NANS looks forward to building on this success in future years. Throughout the course of the year, NANS has also been actively engaged in various advocacy and policy issues. We took an active role in working with several other partner societies, specifically in California. Efforts were focused on the California Department of Workers’ Compensation decision-making process that included drastic reductions and threats to remove spinal cord stimulation as a treatment option for patients. The effort to combat this biased stance included an opioid alternative marketing campaign, educational pieces for physicians and patients throughout the state, and television interviews. NANS volunteers also testified alongside patients benefiting from SCS therapies in the state capital to speak out against the department’s efforts. This past May, the NANS Advocacy and Policy Committee conducted its third annual Leadership Development Course in Chicago. Led by Drs. David Kloth, Jason Pope and Joshua Prager, NANS was able to bring together 20 physician members for this annual seminar focusing on advocacy and policy efforts that NANS supports within the field of neuromodulation. Attendees were selected to participate based upon their interest in becoming more involved with NANS and expanding their knowledge and efforts to be advocates for neuromodulation therapies. The NANS Board looks forward to many of the attendees becoming future leaders of the society and advocates for this therapy. NANS has also applied for formal membership in the AMA House of Delegates. We have greatly increased our efforts to become more involved in the AMA via our membership in the Specialty Section Council and, more specifically, the RUC/CPT process. We have recently learned that we are all but assured of admission. Once NANS receives full admission, we will be able to appoint one physician representative to serve on the CPT and RUC Advisory Committees. NANS’ representatives will then join representatives from the 119 specialty societies currently seated in the AMA House of Delegates. In March, the NANS Board held a Strategic Planning Retreat to lay the foundation for NANS over the course of the next several years. Our priorities are to continue being loud advocates for neuromodulation therapies. We plan on focusing heavily on creating more online education products for the medical community at large and our own members of course. Our two newly elected directors-at-large are Jules Huang, MD and Brian Kopell, MD. Drs. Steven Falowski and Jason Pope were re-elected to the NANS Board. On the operations side, NANS has now hired two additional full time staff, an account administrator and operations manager. This will allow us to focus on more initiatives and accomplish projects that require dedicated staffing resources. Moving towards January, we are finalizing details of the 2018 Annual Meeting. We hope to build upon the success of the 2017 meeting and we look forward to seeing many of our INS colleagues there from January 11 - 14th in Las Vegas. The Spanish Chapter of the INS has entered its second year of activities. Today, we continue with objectives set out in the second meeting of the chapter in October 2016, in Seville; among which is the increase of associates to the INS, now over 30% of the initial quantity, also creation of a National Register of Neurostimulation Implants, and finally contact with the National Organisms of Technological Evaluation. In this sense, we have promoted an audit protocol together with the health authorities, in order to validate the effectiveness of the therapy in relation to its cost, adopting up-to-date decisions according to the results in health. In October 2017 (13th-14th), the President of the Chapter was invited to the Italian meeting. This participation has increased the possibilities regarding exchanges about neurostimulation procedures and results. Thus, it has promoted the sharing of clinical protocols, such as exchange of data concerning results from the application of dorsal root ganglion stimulation, when certain conditions of neuropathic pain, especially postherpetic neuralgia. In October 2017 (20th-21th) we held the third meeting of the Spanish Chapter in Madrid, with over 70 doctors attending and the participation of the entire industry. The subjects discussed were an update therapy of stimulation of the dorsal root ganglion; stimulation without paresthesias; and new technologies, such as ultrasound and robotic surgery, in deep brain stimulation. Many prestigious doctors attended this meeting, such as Dr. Robert Levy (President-elect of the INS), Dr. Dirk De Ridder, Dr. Stefan Schu, Dr. Giuliano De Carolis, Dr. Alessandro Dario (President of the Italian Chapter), Dr. Jan Vesper (President of the German Chapter) and Dr. Mike DeJongste (President of the Benelux Chapter), in which the future of the 1st Joint Congress of the European INS Chapters was discussed. The joint congress will be held in Nijmegen (The Netherlands) next September 2018. The next foreseen meeting of the Spanish Chapter of the INS will be in Malaga (Spain), in October 2020. The aim, in 2018, for the Spanish Chapter still is the increase of INS associates and collaboration with the Technology Assessment Agencies to set up a solid base for neuromodulation therapy to help it to be well-known and funded, as well as participation in the next European Chapter Federation meeting. NSUKI was delighted to be part of the INS in Edinburgh in May 2017 – an excellent meeting with over 1600 delegates. The Cadaver workshop returned a healthy profit and thanks to our “local” organiser Dr Saravana Kanakarajan supported by Roger Strachan, Ganesan Baranidharan and James Fitzgerald along with their North American colleagues: Timothy Deer, Steven Falowski, Jason E. Pope for arranging this. NSUKI ASM in Oxford (11th and 12th November) was a great success. This was a joint meeting with the IASP Specialist Interest Group in Neuromodulation (SIGN). This attracted 140 delegates with 10 exhibitors. We arranged a Spinal Cord Stimulation Simulator Course with the help of Boston Scientific on the 10th November. Twelve trainee neuromodulators attended and were invited to the Faculty Dinner in order to promote and train young neuromodulators. Plans are underway for a combined European Interim meeting next September 2018 in Nijmegen. NSUKI would be delighted to help support/assist this meeting in any way. We plan to run our chapter meeting during this time. At our AGM we were delighted to welcome Thomas Dudding (consultant colorectal surgeon) to the board. Sacral and Gastric Nerve Stimulation is a growing area and we value his input in this field. The members also agreed to produce a training programme and curriculum for neuromodulators with the help of Abdul Lalkhen. This would enable us to approach industry to sponsor courses and fellowships in a structured and efficient way. We have been approached by a group of neuromodulation specialist nurses who are keen to develop a ‘Masters module’ for neuromodulation and NSUKI supports this initiative. This would help to standardise training for this important group of neuromodulators. The Neuromodulation Registry has progressed well and we are aiming to go live in January 2018. The NNR Governance group has met twice and live testing of the NNR has taken place. Thank you to the Pilot centres who have helped in the development of the NNR. Northgate PS continue to work closely with us in achieving the aims of the NNR. With special thanks to all the NSUKI board, Ganesan Baranidharan, Roger Strachan, Sam Eldabe and Simon Thomson for their support and hard work. Despite our ongoing efforts, Intrathecal Drug Delivery to treat chronic non-malignant pain is still not being funded in the NHS. We are collaborating with BSFNS group to continue to lobby for funding for DBS for pain. NSUKI remains a major stakeholder for any techniques being reviewed by NICE. On behalf of the Board and our members may I wish you a Merry Christmas and Happy New Year. The SPARC (Stimulating Peripheral Activity to Relieve Conditions) program at the NIH Common Fund has released two Request-For-Information (RFI) calls soliciting public input on device-based clinical neuromodulation studies, specifically involving peripheral or spinal cord neuromodulation of organ function. One RFI, NOT-RM-17-023, seeks input from surgeons, interventionalists and other relevant clinicians. The other, NOT-RM-17-015, targets industry stakeholders. The overall goal of these RFIs is to obtain strategic input on ways to improve both the therapeutic potential and scientific impact of clinical studies involving neuromodulation devices. Clinician perspectives are needed on various topics such as the state of surgical planning and access tools, clinical considerations related to device design and functionality, and the potential use of clinical settings to collect physiology data for research. Input from industry scientists and engineers is sought on ways to establish effective public-private partnerships around clinical studies, to pursue new therapeutic opportunities using existing technology and to explore the use of devices with expanded research capabilities to maximize data yield from clinical device-based studies. As explained in the RFIs, responses can be submitted via email [email protected], through teleconference meetings with the SPARC team requested at http://nihsparc.setmore.com, or through voice mail messages left at the provided telephone number. Responses must be communicated by March 1st, 2018.
International Neuromodulation Society members have access to an online database of neuromodulation products provided by Neurotech Reports, the publisher of the Neurotech Business Report newsletter. The database is being updated and expanded. It has been available since 2010, through a partnership with Neurotech Reports, from a link on the members' section of the INS website. It contains information on existing and emerging products in a number of product categories, including spinal cord stimulation, deep brain stimulation, leads, power supplies, and many others. Users can search by product category, company name, or medical condition. The database reports details such as approval status, reimbursement, and product description. The collaborative database of published primary data about neuromodulation, WIKISTIM, has surpassed 600 registered users. The searchable wiki now has a responsive web design, which adjusts content display for different-sized screens. That feature should make the free-to-use resource easier to view on-the-go from a mobile phone. Anyone can submit published papers that present primary research data on spinal cord stimulation, deep brain stimulation, dorsal root ganglion stimulation, sacral nerve stimulation, peripheral nerve stimulation, or gastric electrical stimulation. The next envisioned section is on vagus nerve stimulation. Volunteers are welcome to extract data in a structured, uniform format. That format facilitates comparison of findings from different studies, and CME credit is available for data extraction. Authors who use WIKISTIM in literature searches are encouraged to cite WIKISTIM (as www.wikistim.org) whenever it has contributed significantly during production of a review article, discussion section, book chapter, etc. in the same way that researchers would cite The Web of Science, PUBMED, EMBASE, etc. While the resource operates independently of the INS, the vast majority of WIKISTIM's editorial board members belong to the society. Section editors curate entries to ensure only primary data are included. The database links entries to PUBMED (where available) and, if the article is published in the INS journal, to the journal website. In addition, researchers whose abstracts are accepted at meetings of the INS and its chapters may submit for online publication in WIKISTIM full PDFs of their posters, if the subject concerns primary data about topics covered by the wiki. Refer a colleague to INS!